With new ski boots to break in before a trip to Colorado next month, and a Monday off thanks to the President’s day holiday, we booked a car and headed back up to Windham Mountain in the Catskills. It was cold and grey and busy, but once we made it through the lift queue the crowds largely disappeared. Despite having had basically no natural snow at all this season, the slopes were in surprisingly good shape, and we very much enjoyed a morning zooming down the hill. Since our super-chilled trip to Vermont last year I’ve upgraded my jacket, baselayers and gloves, so the fact that the temperature was around 12F (-11C) wasn’t a problem. Not so much for my poor feet however – the nice tight fit of my new ski boots made for excellent ski control but not enough circulation for warming purposes, so our lunch break began extremely painfully. Not fun. Battery-operated boot heaters are likely to be my next purchase, so if anyone has recommendations I’d love to hear them. After lunch Tom also had sore feet – we knew his boots were going to require extra fitting (he has oddly-shaped feet, apparently, at least as far as ski boots are concerned), but he needed to ski in them to determine exactly where they need stretching – and I was keen to keep all my toes alive, so the afternoon session was a little shorter than we’d hoped, and we headed off around 30 minutes before the lifts closed for the day. Still, it was a nice warm-up for our big trip next month, and now we know what needs to be done to our boots for maximum comfort. The journey home was a lot less pleasant than the ride up – 2.5 hours became 4.5 as we encountered falling snow and freezing rain, making for slow and difficult road conditions. New Jersey was particularly bad – the roads here seem to have been laid out by some kind of sadistic maniac, and the drivers educated accordingly – so we were extremely thankful to return the car and get home. On the subject of the car, this time I’d rented a 2015 Ford Focus, and we were completely fascinated by the windscreen design which funnelled snowflakes up and over, without any ever landing on the glass. We’ve driven in falling snow in several different cars now and never seen that happen before. (However, the windscreen wipers really didn’t cope well with the freezing rain, so I guess you can’t have everything!) I was also impressed that I managed to drive for 4.5 hours with just a quick break for comfort and coffee – a new record! – it must have been the mulled wine waiting at home that kept me going…! 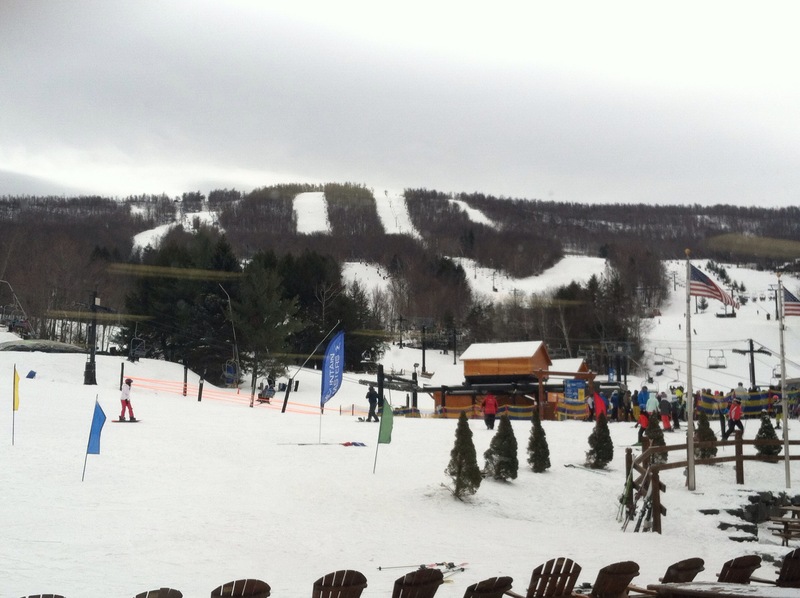 This entry was posted in Exercise and tagged skiing, Windham by Emma Davidson. Bookmark the permalink.